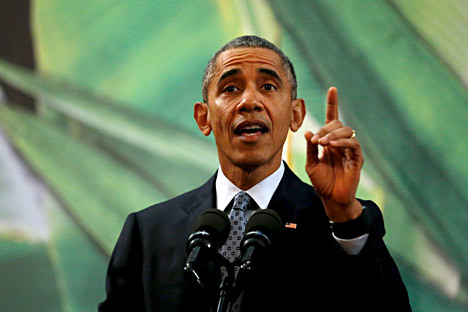 U.S. President Barack Obama gestures while reacting to a question about U.S. politicians opposed to taking in Syrian refugees as he delivers remarks after meeting with the Philippines President Benigno Aquino alongside the APEC summit in Manila, Philippines, November 18, 2015. RBTH presents a selection of views from leading Russian media on international events, featuring reports on the prospect of closer U.S.-Russia in Syria, plans by a Russian athlete accused of doping to sue those who publicized the news, and the creation of a special committee in Russia to gather information on individuals and organizations suspected of being involved in terrorist activity. The Kommersant business daily writes that the U.S. will cooperate with Russia if the Russian operation in Syria concentrates only on the fight against Islamic State (ISIS) militants. "The U.S. and Russia may expand their military cooperation if they overcome their diplomatic differences over Syria," the newspaper cites U.S. President Barack Obama, who is in Manila for the APEC Summit on Nov. 18-19, as saying. The American president remarked that Russia was a "constructive partner" during the diplomatic talks on regulating the situation in Syria, the latest round of which took place in Vienna on Nov. 14. However, Obama underlined that there remain differences between Washington and Moscow on Syrian Presidet Bashar al-Assad's political future. Obama also called on Russia to concentrate its air strikes in Syria on targets linked to the ISIS terrorist organization. "It is likely that Russia will reorient itself towards this objective since it has become clear that ISIS was responsible for the awful tragedy involving one of its [Russia’s] planes," said Obama. This statement was made less than a day after Russian President Vladimir Putin was officially informed that the Russian passenger airliner crash in Egypt on Oct. 31 was a terrorist act. Putin immediately promised to "find and punish the criminals" and do this "without the statute of limitations," as well as intensify the activity by Russia’s air force in Syria so that "the criminals understand that revenge is inevitable." The Lenta.ru news website isfollowing the development of the Russian doping scandal. The publication writes that the Russian athletes whom the World Anti-Doping Agency (WADA)’s independent commission recommended to permanently ban for using performance-enhancing drugs are suing the main denunciators – track and field athlete Yulia Stepanova and her husband Vitaly Stepanov. Lenta.ru reminds its readers that the couple provided the German TV channel ARD with evidence that certain Russian athletes had been doping. On Nov. 13 the International Association of Athletics Federations (IAAF) decided to indefinitely disqualify the Russian Athletics Federation from international competitions based on the WADA report. The athletes who are accused of taking the illegal drugs have been recommended to be disqualified for life. "First there will be a regional trial, then the process will grow. The lawsuit will be filed for libel and the protection of honor and integrity. Then there will be a lawsuit against the German ARD TV Channel," said runner Kristina Ugarova, one of the claimants wanting to sue the Stepanovs. On Nov. 16 it was reported that the Stepanovs had asked for political asylum in Canada. The Rossiyskaya Gazeta daily reports that a special committee is to be formed in order to collect information on organizations and citizens that are not on the Russian terrorist list but are nevertheless suspected of being involved in the activity. This will be done with the aim of freezing (blocking) the financial resources and other assets belonging to these organizations and citizens. The interagency committee is being formed with various representatives from the federal government organs, with committee members soon to be reviewed and confirmed by the president. Russian President Vladimir Putin also suggested that the Prosecutor General's office, the Central Bank, the regional governments, the local authority organs and other government organs and institutions send the committee information on the possible involvement of various organizations and citizens in terrorist activity. "The committee is being created within the framework of a common anti-terrorist activity," explained presidential press secretary Dmitry Peskov. "Since the eradication of resources directed at financing terrorism requires efforts from various institutions, they therefore must be coordinated. This is what the committee will be doing." The committee will have no more than 30 days to review material containing information on possible involvement in terrorist activity. In the event a citizen's assets are frozen, they will be entitled to a monthly humanitarian subsidy. The committee will verify and clarify information on organizations and citizens whose assets have been frozen at least once every six months. The decision may be appealed in court. Press Digest: Russia looking to mend fences with Europe and U.S.